It looks & feels like real rock! Your guests will love the challenge of scaling this 23' wall. The dual redundancy auto-belay system ensures maximum safety. Climbing Rock wall rentals are an experience worth remembering. 3 participants can simultaneously climb the rock wall rental. 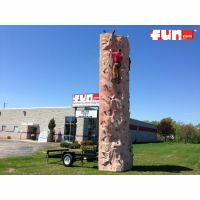 The Rock Climbing Wall Rental by Fun Events Inc.
Our Rockwall rental is safe, portable, and can be set up mostly anywhere. Entertain your guests by challenging them to climb one of the three rock wall climbing zones. Once they reach the top, there is a buzzer alarm button that they can press to signify that they made it. Minimum Weight: 45 Lbs, Maximum 250 Lbs. Guests wear a safety harness that is attached to the belay cable. If they let go or lose their grip, the rock climbing wall safety system will slowly bring them to the ground. Our fun event staff will supervise and operate this attraction. It looks & feels like real rock! Your guests will love the challenge of climbing this 23' tall rock wall. The dual redundancy auto-belay system ensures maximum safety. Climbing Rock walls are a popular event experience worth attempting to scale. 3 participants can simultaneously climb the rock wall rental. Wisconsin & Illinois event rental favorite.